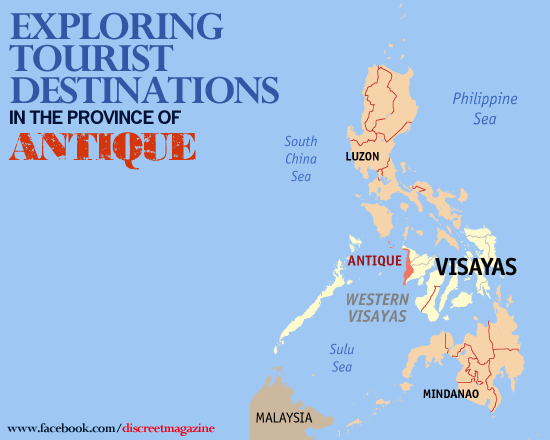 This post that hopes to help us explore the province of Antique, is dedicated to the promotion and discovery of the province tourist attractions. It also hopes to gather the right balance of information for an enjoyable online experience. WHERE IS THE PROVINCE OF ANTIQUE? Antique is where the mountains meet the sea. Allow yourself some enchantment and adventure. Visit Antique, historic land of the Binirayan Festival, majestic mountains, cascading waterfalls, white beaches, rich fishing grounds and white water kayaking. Activities are many and exciting. Go trekking, boating, swimming, shell hunting, snorkelling, scuba diving and fishing. nogas Island and Sira-an hot Springs are "must-see." Or you may time your visit during the Binirayan festival and experience not only the festival itself but many other related events. Antique is a province of the Philippines located in the region of Western Visayas. The province's capital, San Jose, is located in the western portion of Panay Island and borders Aklan, Capiz and Iloilo to the east, whilst facing the Sulu Sea to the west. Click here to know more about Antique. Explore Philippines Tourist Destinations was created to provide awareness of the beauty of the Philippines and to promote Philippine tourism. This series strives to explore and discover the wonders of the Philippines so we may preserve it for future generations. You have read this articleAntique / Antique Tourist Destinations / Antique Tourist Spots / Philippine Tourist Destinations / Philippine Tourist Spots with the title EXPLORING TOURIST DESTINATIONS IN ANTIQUE. You can bookmark this page URL https://thehalflifeoflinoleum.blogspot.com/2013/12/exploring-tourist-destinations-in.html. Thanks! Comments "EXPLORING TOURIST DESTINATIONS IN ANTIQUE"